Today’s chromatography lab needs to meet stringent regulations around data integrity; all analyses must be conducted with total transparency, and workflows must be robust and secure. Chromatography data systems (CDS) are incredibly effective at improving overall efficiencies and reducing user-error in the lab, but they can also advance compliance and data integrity. Sterling Pharma Solutions, a contract development and manufacturing organization with a large chromatography laboratory, wanted to significantly improve its data integrity and compliance processes to meet the demands of modern audits and regulations. Audit trails are important to provide a historical record of all analyses. These records demonstrate proof of compliance and workflow integrity, and can also identify areas that are lacking in compliance, enabling them to be assessed and corrected. Sterling’s new CDS ensured that audit trails were permanently switched on for all analyses. This is incredibly important for data integrity purposes, as it means that all processes are monitored and can be audited if needed. As well as this, to ensure that all analytical actions are attributable, the users log in to personal accounts that are password protected and traceable. In addition, all audit trail actions are time-stamped, with the date and time unable to be changed, ensuring a contextual record of all experiments performed, providing an accurate and complete picture of the analytical process. The user must submit the ‘why’, providing colleagues, auditors, and clients context at each stage of the chain. Without this CDS in place, Sterling could be following a lengthy paper trail when it comes to auditing. Now with this software, all audit trails are immediately available and incorruptible. So, when it comes to auditing, the full story is told. 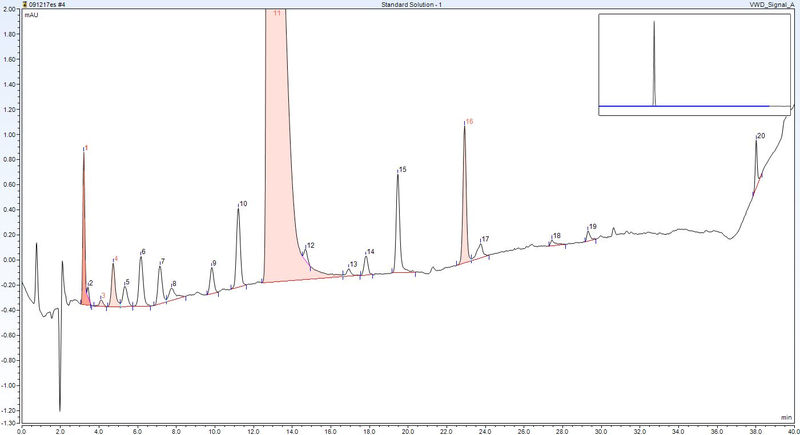 Today, when peaks from multiple analyses are integrated, they are scrutinized more than ever before. Before Sterling upgraded to its modern CDS, it relied heavily on user-defined peak identification and integration; this manual integration reduced the data’s integrity, as there is the possibility that peaks could be integrated into compliance. With the implementation of its new CDS, Sterling drastically reduced the number of manual integrations required. The innovative use of computer algorithms within the software of the CDS means that it can automatically identify and integrate several peaks at once. Figure 1 shows this powerful technique defining 20 peaks in the first attempt, while being faster and more accurate than manual integration. Figure 1: 20 peaks were defined in the first attempt using the CDS, demonstrating the speed and accuracy benefits over manual integration methods. An auditor should recognize the need where necessary for manual integration, but if it is used excessively, there is the possibility that they will conclude that data is being manipulated. Using its CDS, Sterling has been able to instill a culture change where user-defined integration is now the exception rather than the norm. In fact, Sterling has been monitoring the decline of manual integration from over 70% to below 20% with its CDS, Figure 2 shows this decrease. 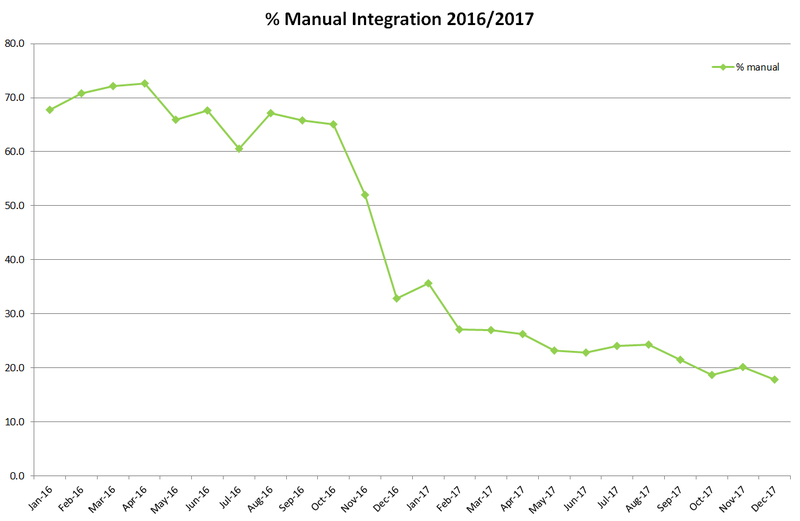 Figure 2: Percentage of manual integration declining over time since CDS implementation. To comply fully with data integrity and auditing regulations, and to ensure total data completeness, it is important that a laboratory must reduce the possibility of ‘orphan data’. Orphan data has no provenance, or lacks crucial information, and therefore cannot be used as an acceptable result. Restricting the occurrence of orphan data ensures that analysts are not cherry-picking good results, and failing results cannot be deleted, hidden, or ignored. With the installation of the new CDS, Sterling was able to combat this issue head-on, as the software prevented the deletion of data. All data are recorded and logged, and require electronic signatures to submit and review all sequences, a feature that ensures all sequences are assessed along with the audit trails. Data integrity that is robust enough to stand up to intense scrutiny is now an essential part of a company’s workflow. An effective way to address these issues is to implement a comprehensive CDS across the whole laboratory. With this in place, audit trails can become easily available, manual integrations are reduced to a necessary minimum, and data cannot be deleted or altered. A CDS can ensure a rigorous approach to data integrity and compliance, telling the whole story of analysis.